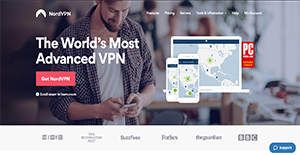 NordVPN is a robust VPN solution for private individuals and businesses of all sizes. The software ensures the online protection of its users through its military-grade encryption and strict no-logging policy. This way, users can rest assured that no one is tracking or monitoring their internet usage and behavior. Furthermore, companies can utilize NordVPN to conduct anonymous market research and test their products globally. Having unhindered access to a world of online data makes certain they gain accurate market insights. Moreover, NordVPN offers protection to all kinds of devices. This gives subscribers a true peace of mind since they know that their activities cannot be logged no matter which device they are on. NordVPN lets you use public Wi-Fi and personal and work accounts while on the go with confidence. Users can also keep their browsing history to themselves for privacy. The software works for any device: Windows, macOS, Linux, iOS, Android, Android TV. Chrome and Firefox also have encrypted proxy extensions. With a single account, you can protect all types of devices up to six of them all at the same time. NordVPN can be used anywhere. It has over 5,000 servers in 62 countries which means you can assure streaming and downloading files don’t experience any lags. In affordable tiered plans, users will get features such as double encryption, unlimited bandwidth, no logs policy, pay in crypto and kill switch, among others. With NordVPN, a user is able to connect up to 6 accounts under one account. Even so, they can rest assured that their online security and privacy are not compromised. Furthermore, the VPN application is available for different platforms such as Mac and other Apple devices, Windows, and Android. This enables users to enjoy NordVPN’s protection no matter which device they are on. NordVPN also provides protection to Android and Ios devices through its smart and user-friendly apps. These are designed to ensure safety when the connection to the secure server goes down. This way, no application is able to access the internet outside of the protected VPN tunnel. This gives users a peace of mind that their personal information remains private at all times. NordVPN promises its users complete anonymity on the web. This entails a strict no-logging policy. This means that a person’s internet activities and usage behaviors are not recorded online. Therefore, NordVPN is not able to provide information regarding their customers’ internet usage behavior to users themselves, government agencies, or any other third party. NordVPN’s business solution offers protection not just for executives of a company but for all employees. This way, everyone is able to securely receive and relay data over the internet with their colleagues, customers, and other stakeholders. This protects not just the company but also the customers. With NordVPN, users can do online transactions with no fear. The software’s military-grade encryption makes certain that financial processes have a double layer of protection so they remain secure at all times. Companies can test-drive their products on the internet in a click. With NordVPN, they can access the internet with no boundaries and gain accurate market knowledge and insights. Furthermore, NordVPN enables businesses to conduct field researchers without revealing their identities or locations. The software alters the IP address for companies to be untraceable. What Problems Will NordVPN Solve? With NordVPN, users can work globally. The software enables them to experience the internet with no restrictions and provides them with unhindered access to geo-specific websites and content. Companies with an international reach can test their product in different markets with NordVPN. The software enables this through more than a thousand VPN servers that let them access an unobstructed internet. NordVPN also enables businesses to conduct market researches without giving away company details and most especially, the company’s location. It does so by changing the organization’s IP address to ensure that they remain anonymous. With NordVPN, users are able to see the internet without impediments. This allows them to verify ad campaigns, look for SEO keywords, and see geo-locked video content without difficulties. If you are interested in NordVPN it could also be sensible to examine other subcategories of Best VPN Services collected in our base of SaaS software reviews. Every enterprise has different requirements and needs a system that can be customized for their size, type of staff members and buyers, and the particular industry they are in. For these reasons, no software can proffer perfect tools out-of-the-box. When you look for a software system, first be sure what you require it for. Read some NordVPN reviews and ask yourself do you need basic functionality or do you need complex tools? Are there any industry-specific features that you are looking for? Obtain the answers to these questions to help your search. There are lots of factors that you need to mull over and these include your finances, particular business needs, your company size, integration needs etc. Take your time, use a few free trials, and finally select the platform that presents all that you require to boost your firm competence and productivity. How Much Does NordVPN Cost? We realize that when you make a decision to buy VPN Services it’s important not only to see how experts evaluate it in their reviews, but also to find out if the real people and companies that buy it are actually satisfied with the product. That’s why we’ve created our behavior-based Customer Satisfaction Algorithm™ that gathers customer reviews, comments and NordVPN reviews across a wide range of social media sites. The data is then presented in an easy to digest form showing how many people had positive and negative experience with NordVPN. With that information at hand you should be equipped to make an informed buying decision that you won’t regret. What are NordVPN pricing details? What integrations are available for NordVPN? NordVPN does not support integrations with third-party applications. Pros: I used the chat service and was surprised of a prompt reply. I was expecting they’d respond via email. Anyway, I’m happy I can reach out to them any moment. My issue is nothing major, a login glitch where the rep suggested a reboot that quickly solved the problem. Cons: There’s this login glitch that made me to reboot the system every so often. Not sure if it’s on my end or the VPN’s. Pros: There’s strict no-log policy. That’s important and to think other VPNs don’t insist on this. I’m assured my net activities aren’t saved, hence, can’t be tracked not even by my VPN. Other likable things about it are good speed, no connection loss and ease of use. Cons: Nothing so far. I’ve been using it for 4 months now and I’m pretty satisfied. If you need more information about NordVPN or you simply have a question let us know what you need and we’ll forward your request directly to the vendor.